In ancient records Towednack Church is named as the chapel of Saint Ewin. There was also a chapelry at St Ives and both were administered from the parish church of St Uny Lelant. Both these chapelries appear to have had parochial boundaries and there is a record of the year 1340 suggesting this in the case of Towednack. Their distance, however from Lelant must have been the cause of great inconvenience and led to a petition being made to lessen this. As a result of this petition there was a recommendation by Pope John XXII a schismatic Pope of the 15th Century (The famous Pope John XXIII who died in 1963, took the same title) This petition went to the Bishop Stafford of Exeter which included Cornwall in its diocese,that the Chapelries of St Tewinnoc(Towednack) and St Ives be made parochial but dependant on Lelant. These recommendations were made on 18/11/1410 and were apparently implemented. The right of sepulchre was not granted to Towednack until 1532. 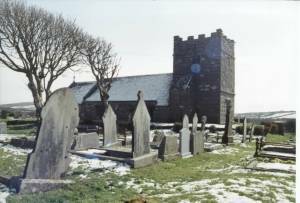 In 1903 it was constituted as a seperate benefice and since 1947 has been held in plurality with Zennor. The church, which probably stands on the site of an earlier one, is a diminutive building of considerable interest. It is the only church in West Cornwall to possess a Chancel arch and this dates from the late 13th or 14th century. The Nave and parts of the North Wall are Norman. The South Aisle was added in 1460 and the Tower in 1500. The Tower is squat and massive. There is a legend which purports to explain its lack of height. When the courses were being built by the masons had reached a certain level the devil came and knocked down subsequent building every night. This happened time and time again. As the work was resumed by day so it was removed by night. Finally the builders in despair erected the battlements as they are today. The Tower staircase in unusual, springing direct from the North West angle of the Nave in the church itself with five steps. At one time there was a Gallery at the west end of the Nave. Perhaps the most striking feature of the church is the stone Altar. It is roughly hewn from a solid block of granite and has five crosses incised at the centre and four corners (these crosses representing the five wounds of Christ). It is late Norman and was probably thrown out at the Reformation which required that altars should be of wood. At the beginning of this century the late H Dunstan, Churchwarden discovered it forming part of a wall at churchtown farm. It was bought into the church again and in 1934 a faculty was obtained for its restoration and use. There can be very few altars in West Country churches of such age. Almost certainly the church in the past contained many finely carved bench ends but today only two remain which are of great interest.They have been used to form a chancel seat which is situated on the North side of the Altar. On each is carved in deep relief the profile of a very Spanish looking gentleman in a high felt hat with sweeping curves and wearing moustaches and a pointed beard. One bears thelettering Matthew Trenwith Warden and the other James Trewhella Warden and are inscribed date is 1633. A support for a rood loft remains on the south side of the chancel arch, The northern door was blocked up when the church was restored in 1870. The Font is a simple octagonal shape dated 1720 and bears the initials W B and J R it is unusual in that the base is the inverted bowl of a much earlier font undoubtedly Norman. Inside the South Porch there is an interesting stone with an incised cross of the Celtic period and it is thought to be the shaft of a cross which stood on or near the site. Over the porch gate is a small sundial dated 1720, and bearing the following inscription "Bright Sol and Luna Time and Tide doth hold Chronodix Humbrale". In 1933 Towednack was the first church in Modern times to hold a service said in the Cornish Language followed by the Gorsedd. There is now a full peal of 8 bells of which 3 are medieval. In June 1905 3 bells were recast and a 4th added at the cost of 184.15 poundsby John Warner of London. Two new bells to complete the peal of 6 were dedicated by the Lord Bishop of St Germans on 14/2/1912 Two more bells to make a peal of 8 were given by H Dunstan, Esq in 1947 and dedicated by the Bishop of Truro. The Work was carried out by Gillet and Johnson of Croydon. In recent years the bells were re-hung on ball bearings at a cost of 867.00 pounds by the offers of local assistance this was reduced to 787 pounds and the Baron Bell Trust contributed 300 pounds. The balance was raised within 12 months by enthusiasm and hard work of the parish. the work was carried out by Mr A Fidler of Bow, Devon and the bells were re-dedicated on 17/4/1973 by the Rt Revd. J M Key Lord Bishop of Truro. Amalveor Farm is about one mile due west of the Church and on 11th December 1931, a pair of gold bracelets were discovered in the course of farm work. At the inquest they were declared to be treasure trove on the evidence given and were dated as being of the middle Bronze age about 1000BC They are in the British Museum. There were once 22 tin mines in Towednack parish alone and of these GIEW was the last to close in 1923. The farm house at Towednack Churchtown behind the church was a public house in 1880 and some years ago there were 2 public houses in Nancledra "Ye Old Inn" and the "Miners Arms" There were 2 at Cripplesease "The Engine Inn" and "The Wink" of all these "The Engine Inn" is the sole survivor. In 1975 Towednack church was used for the Marriage and Burial services in the BBC series Poldark. In 1979, It was used in the series Penmarric in 1987 there was a great Ecumenical Celtic Pilgrimage to Towednack to celebrate the connection between the Church and abbey of Landevennac In Brittany. 1300 people were present including the Bishops of Truro and St Germans, The Roman Catholic Bishop of Plymouth, The Abbots of Landevennac and Buckfast, The Methodist Chairman for Cornwall and Professor C Thomas who gave a lecture on Celtic Spirituality. Compiled by C Norman Hollow on his retirement in 1977 as Church Warden of Towednack after 25 years service.